To have any chance of catching fish you need to know where they are. Some stretches of water will hold more fish than other places. The question is....how do you discover the best places to fish? Fishing and talking with an experienced angler is a useful way of picking up tips and information. 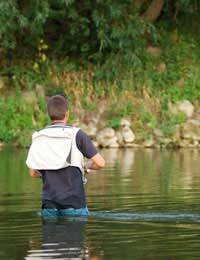 Also, when you are out and about, notice swims that are regularly used by anglers. But the real knowledge is gained by understanding how to read the water. All animals, including humans, share a natural instinct to survive. Food is essential for survival therefore fish will be found where there is a supply of food. Some species of fish are lower down on the food chain and will themselves be a source of food for predators. Fish such as dace, roach and fry of most species need a place of safety to hide. Predatory fish such as pike and large perch will also need a place to hide while they wait to attack smaller fish. The place where there is a regular supply of food for fish is next to the riverbank. Overhanging branches, bushes and marginal plants are the habitat for a multitude of insects and mini-beasts that constantly drop or are blown onto the surface of the water. Tackling up away from the water and approaching the riverbank with care are the obvious ways not to disturb fish that are close in. Keep movement to a minimum once you are in a position to cast. Fish have a series of holes down their sides called a lateral line. This lateral lines detects vibrations so avoid heavy footsteps and dropping equipment. If fish see or feel no threat they will continue to feed close to the riverbank. Float fishing with a single maggot beneath overhanging trees will be successful or try legering with a small redworm from the compost heap. Look for areas where the river has eroded an undercut into the bank because these are often the perfect ambush locations favoured by pike and large perch. Swims where there are submerged roots and snags are frequented by chub, barbel and eels. Feeding fish are likely to be found where side streams join main rivers and in the dark waters beneath bridges. Oxygenated water created by rapids, weirs and plunge pools are places to catch dace, grayling and trout. Gravel beds and floating strands of streamer weed will hold barbel, roach, dace and gudgeon. Slack water behind huge boulders are often resting places for large fish keeping a sharp eye open for passing food. Spare a few minutes just to stand still and observe the surface of the water. There are usually signs that indicate the presence of fish. Look for dimples caused by surface feeding fish and watch out for swirls and splashes made by hungry predators. Winter fishing is very popular with many anglers. It is a time to catch quality grayling and large pike. However, many of the features that were obvious during summer months may have changed or even completely disappeared under high water levels. There may be days when fishing might seem out of the question....but the fish are still there! Strong currents may be just too powerful for some fish so they will seek out calmer water and deep pools close to the riverbank. Bends of rivers will have sluggish eddies where fish can feed and also side streams provide sanctuary for many species of fish. Understanding a river takes time. Each day of fishing provides extra insight and information until, eventually, reading a river becomes second nature.